Directions: From Gatlinburg, turn right at Sugarlands Visitor Center and drive just over 3 miles on Fighting Creek Gap Rd. The trailhead is on the right about a mile before the entrance to Elkmont Campground. It goes without saying that Laurel Falls Trail is one of the most popular hikes in the Great Smoky Mountains National Park. This waterfall trail near Gatlinburg is considered by many to be a must see. On an average summer afternoon, the trailhead to Laurel Falls is packed with cars. It's a safe bet that more hikers choose Laurel Falls Trail than any other hike in the park. But with 800 miles of hiking trail in the Smoky Mountains, what makes Laurel Falls so noteworthy? Beauty - The waterfall is an 80 multi-tiered waterfall on the Laurel Branch creek. 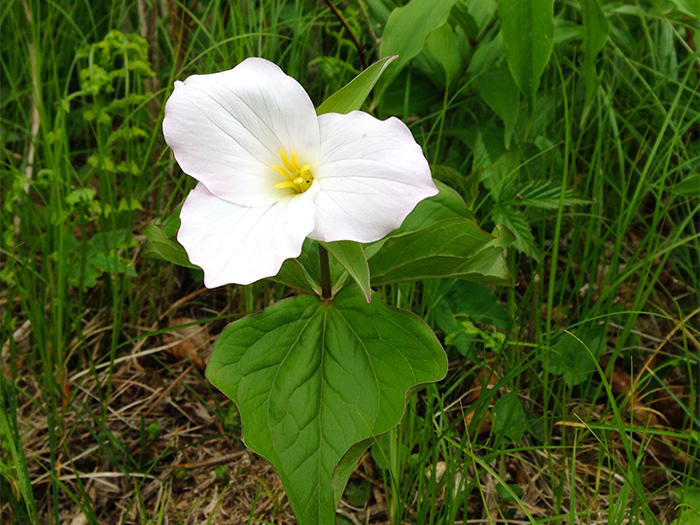 It is simply beautiful and has attracted a lot of attention over the years. Proximity - The falls are only a few miles from Downtown Gatlinburg, TN. As the main gateway to the national park, Gatlinburg is the first stop for most visitors in the national park. 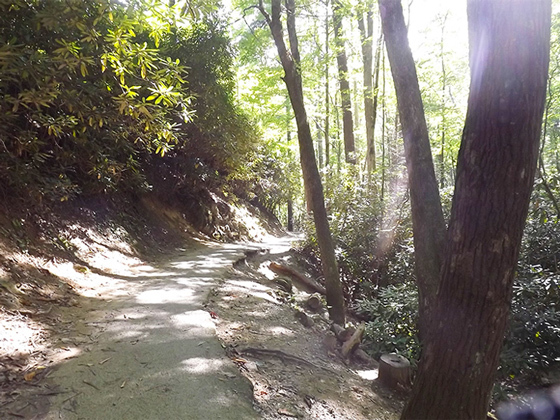 Trails close to Gatlinburg receive lots of attention and foot traffic. Accessibility - This trail is considered one of the most accessible trails in the park. The hike to falls is an easy 1.3 miles and the trail is paved. These features make the Laurel Falls Trail an easier hike suitable for young and old visitors alike. 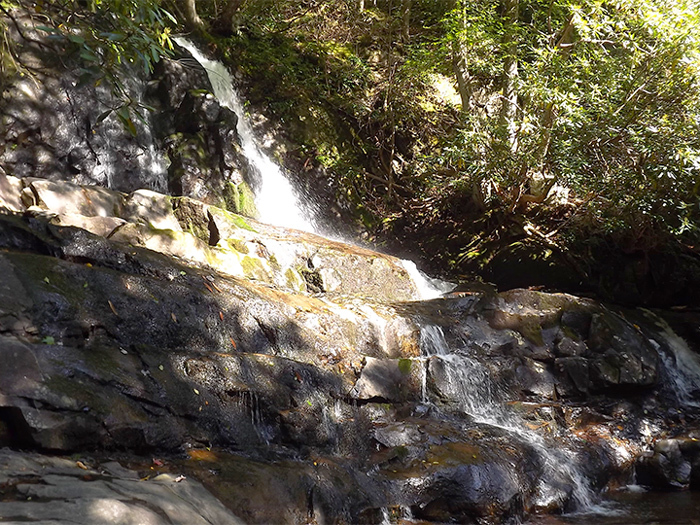 The Laurel Falls trailhead is located 3.5 miles from Sugarlands Visitor Center on Fighting Creek Gap Road. From Gatlinburg, simply take a right at the Sugarlands Visitor Center towards Elkmont and Cades Cove. After a couple miles, you'll pass by an overlook on your right that offers views of Mt. LeConte and the Sugarlands Valley. The parking area for the trail is located a short distance further. This popular trail is one of the only paved trails in the park – but this doesn't mean the hike is accessible by wheelchairs. The pavement has large cracks and breaks in it. In fact, a small land slide temporarily closed Laurel Falls to hikers in spring of 2015. The trail is now open, but only after serious maintenance to the trail. Because the pavement is uneven, do proceed with caution when hiking Laurel Falls Trail. This is especially true after wet weather. The area around the falls also has lots of slippery rocks. There are also sections of this trail with steep drop-offs so watch children closely. The trail winds steadily up the mountain and passes through beautiful 2nd growth forest. There are large stands of mountain laurel or Rhododendron that bloom white in May. Occasionally, hikers will be able to spy views of nearby mountains like Meigs Mountain and Miry Ridge. Before long, you'll hear the sounds of rushing water and notice that the air is cooler. At 1.3 miles in, hikers will reach the falls. The trail continues over a concrete foot-bridge that passes between two tiers of the falls. This spot is a great place to admire the falls, but hikers can continue further on the Laurel Falls Trail. From this point onward, the trail is no longer paved and can become quite steep in sections. The hike continues on through old growth forests that have never been logged. After 2.7 miles, visitors can reach the Cove Mountain Fire Tower, one of only 3 fire towers still standing in the national park. Bring Your Camera – Laurel Falls is an excellent spot for a photo op. With white, rushing water behind you and a glorious forest canopy above – this is a truly scenic waterfall hike in the Smokies. Watch For Bears – In 2010, a bear that had become accustomed to being fed by humans approached and bit a hiker on this trail. Unfortunately, the bear had to be euthanized. To avoid unwanted encounters and to protect bears in the Smokies, please don't leave trash and food scraps on the trail. Start Your Hike Early in the Day – Since Laurel Falls is so popular, hiking this trail on a weekend in peak season can feel like you're at an amusement park. To enjoy Laurel Falls fully, try hiking this trail before noon or by visiting on a weekday. Stay Close By - Renting a log cabin in Gatlinburg, TN can keep you close to great waterfall hikes like Laurel Falls. As a result, you can enjoy more time in the mountains and beat the crowds to some of the most beautiful sights in the Smokies! Visit After Rain – Like other waterfalls in the national park, the falls are more spectacular with high water volume. Laurel Falls is an extremely popular hike. As a result, the trailhead may be too crowded to find safe parking and the trail may be too crowded to actually enjoy a peaceful walk in nature. To experience a similarly beautiful waterfall hike without the crowds, try visiting the Middle Prong Trail in Tremont.